“So, here’s how you make my crab mousse lasagne.” Oh, blimey, OK – hello, nice to meet you. We’ve started already have we? No gentle introduction just straight in there. Get your crab meat and some other stuff, wack it in the blender – off you go. 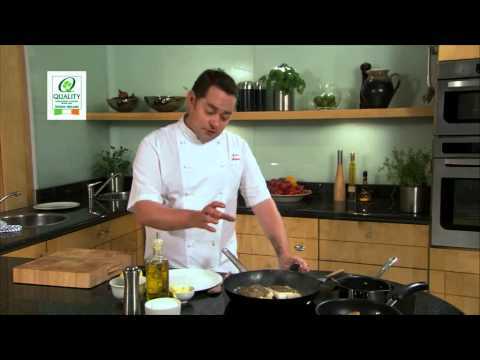 Neven Maguire is a ‘celebrity chef’ in Ireland with many awards and books under his belt. He has a fine array of pullovers too. He looks like he’s just come from the golf course and decided to rustle up a couple of dishes. Which he does. He follows up his lasagne with roasted butternut squash, pancetta and pine nut pasta which doesn’t look the most appetising but maybe that’s me. Now, this series is called ‘Neven’s Food in the Sun’ and after the commercial break we briefly see him perched by a beautiful bay where he introduces the pasta dish he’s about to make. This is the only time where we see Nevan outside the snug confines of the kitchen. The show could have been filmed anywhere – maybe he has just come from the 18th hole? Just when I thought Nevan was bordering on dull and uncontroversial, I happened upon this 2009 story of a Food and Wine magazine cover which involved recent Celebrity Big Brother inhabitant Georgia Salpa – blimey! Unfortunately this tale of swimwear and hors d’oeuvres doesn’t make him cool. The enthusiasm keeps coming, terrible jokes, and boring stories. Heard the one about his dad living in the UK not being able to sell oxtail soup coz, yuck, oxtail’s GROSS? He renamed it end of year soup instead and people started to order it! Y’know, ‘end of year’ – you eat it in the winter and the tail is near the rear of the beast … [sigh] or something. FFS, James. Get on with it. The food itself (sorry, got a bit sidetracked there) seemed nice enough and not too difficult. The standout dish was the lamb salad on a bed of cos lettuce (“why is it the best? COS!”), tomatoes and the ribboned gourd. It seems James is a local lad afterall, starting off in Bristol then hopping across the Channel to work in Paris. Look, I’m sure he’s top bloke but I don’t think I can take any more tomfoolery, you dag. It’s all been really enjoyable telly but the Italy episode of the The Hairy Bikers’ Bakeation was a particularly good one for me. I generally prefer savoury to sweet baking and the emphasis was on bread and pizzas – obvious but it’s always worth repeating how simple and satisfying this stuff is to make. 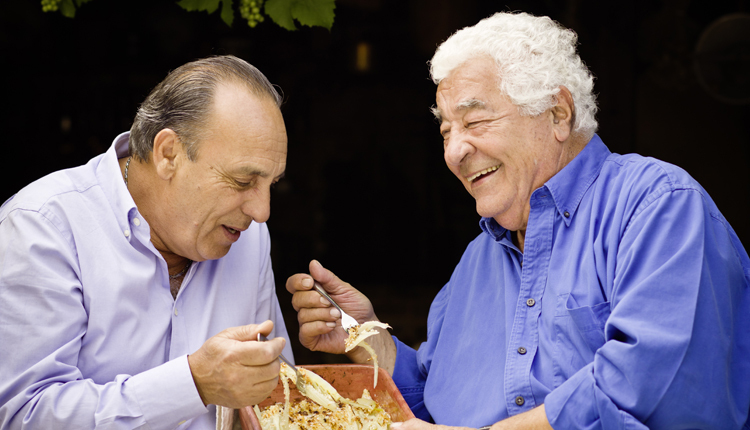 Filling the Blanc shaped hole in the BBC schedule is the return of the greedy Gennaro Contaldo and Antonio Carluccio. Sadly the first series passed me by. I must catch up on these as it was an absolute treat. Gennaro Contaldo and ... Barry Cryer? 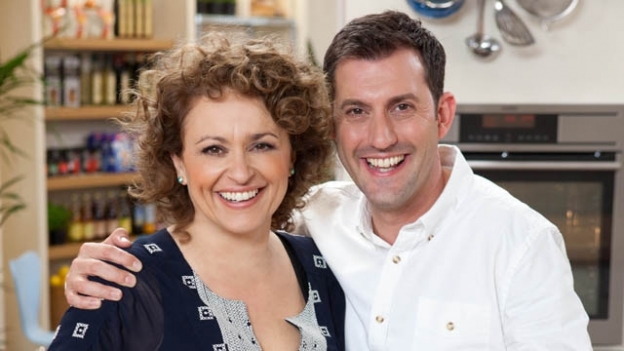 In a similar vein to Raymond’s trip across France, the two ex-pats return to Italy to create some lovely dishes and generally make mischief. The two old friends drove a beautiful car, stole fruit and butchered a pig. Like you do. I continually ponder ‘what is the ideal amount THEN?’ in response to a judge’s critique that ‘it could do with a bit more seasoning’. I’ve heard that chefs are not your average bear when it comes to taste – of course, their palate is refined and sublime and their tastebuds are advanced and enlightened. So, what about the normal schmoes like me? Having typed ‘what is the correct amount of seasoning’ into three search engines, I am none the wiser. Responses are generally to keep adding until it tastes right. Hmmm, that’s not the answer I’m looking for … I’d like to taste a dish with zero salt and pepper and compare it to the same dish that’s been seasoned ‘correctly’ to a chefs standard. Would each chef come up with a different tasting dish? I think I will make something basic (mashed potato? ), see if I can add measured amounts of salt n pepa and see what occurs.